Is HTTPS filtered on Firefox? Discussion in 'Technical Support (AdGuard for Windows)' started by edgard, Feb 23, 2014. HTTPS filtering works fine for ie11 and opera18, but not working on Firefox 27. Is https filtering supported for firefox? Yes it does but with one exception. Firefox should be closed when you install Adguard. 2. Disable protection in Adguard. Wait for a few seconds. 3. Enable protection in Adguard on. Wait for 30-60 seconds. 4. Open your browser. The problem should be solved. Or you could just reboot your computer. Admins can move this thread to beta section. Anyway, I'm still having problem with some https site being not filtered in Firefox with the latest beta. 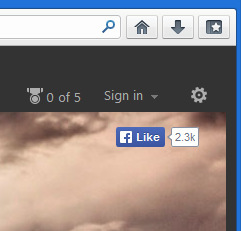 I've the Social network filter enabled, but as you can see above, it still loads the facebook like button on https://www.bing.com. On the non-secure bing, the social network filter does it job. The problem is that I cannot reproduce it. I do not see this button on bing.com at all with or without Adguard. Does it happen on bing only? If you're not in the North American region, change bing setting to the U.S version. Maybe international version of bing doesn't load in facebook, but certainly for the U.S it does. Wow, really So many new elements on the home page. Looking like Adguard still did not enable HTTPS filtration for Firefox. No. I rebooted a couple times after update to latest beta, but didn't seem to helped. Also I was wondering how does the SSL spoofing/intercept work in Adguard? Is it possible the certificate for Adguard isn't being added to Firefox? Again, does HTTPS work for other websites? If it does, you could of uncovered a Adguard bug. The issue with Firefox caused by the fact that we cannot import our certificate in it's storage when Firefox is running. We'll fix certificate import in new version - make it faster. Now we just scan all user's %appdata% for Firefox and Opera certificate storages. It could be rather slow - so you . We should check default firefox appdata folders first, not just scanning all appdata folders. Also this article explains how Adguard filters secure connections. I've found a bug in beta-version and release version. Don't understand how we've missed it earlier. The only thought - it is because of the last Firefox release. HTTPS filtration in Firefox 27 won't start if Adguard has been started after Firefox. This is critical, we'll fix it ASAP in release version also. I'll look forward for that release. Though, in the mean time, I tried the manual way and deleted the adguard.cer from Firefox and restart it after adguard. However, the pesky facebook button still loads on bing. Good news is that it does not load anywhere else. Moreover, I downloaded a portable version of Firefox to test, and guess what? No facebook button! Maybe my main Firefox profile is corrupted or something. Any clues? You could try backing up your Firefox profile and deleting the profile files with Firefox closed, then open up Firefox for a clean profile (just manually import the certificate immediately then close Firefox and reopen it again). Ok, I've finally got it working after resetting my profile. Also, I've found why my earlier profile got facebook button through. I had security.mixed_content.block_active_content turned off in Firefox config. Now it's back on and facebook button is no longer there. Yay! However, I have a question on it regarding adguard. If mix_content is turned off and the facebook button got through, does that mean Adguard didn't do its job? It should not influence https filtration. I still think the problem is in Adguard's defect that is now fixed. Could you update to the latest beta-version and turn this option on again? Ok, I updated to the lastest beta (5.9.1063.5441) and turned on mixed content for both Firefox27 and IE11. Facebook still got through in Firefox, but not in IE11. Did you make sure to clear the cache of all browsers? I'd also take the opportunity to flush your DNS too by opening a Command Prompt window and putting ipconfig /flushdns into it.